This is an ideal Christmas recipe for low fodmappers who want to have a festive bread without marzipan and probably one of the only bread recipes that I have managed to produce that has risen well! It is based on an enriched bead dough mix produced using a standard purchased bread flour. Add the flour, spices salt and dark chocolate chips to a bowl, mix. Separate the yolk from the white of the eggs. To the white add a pinch of cream of tartar and whisk till peaks are formed, adding 25g of sugar half way through, then add the rest when soft peaks are formed. Start adding the water to the dry ingredients and mix with a hand mixer. Then add the yolks. Fold into the mix half the beaten egg whites quickly to slacken the mix. The gently fold in the rest of the egg white. Add to bread tins and leave in a warm place for 30 minutes to rise. Cook in a warm oven (200˚C, Fan 180˚C, 400˚F, Gas 6) for 30 minutes until cooked. Just the ticket for giving out to friends who come caroling. 3-4 drops of peppermint flavouring. Add the egg whites to a bowl and add the peppermint, cream of tartar and whisk, when they are forming peaks add half the castor sugar and whisk till they form stiff peaks. Add the rest of the castor sugar, mix and then spoon out into a Teflon baking sheet. Melt the chocolate and cover the surface of the meringue and allow to set. The holiday season means many different things to different people, it is supposed to be a period of joy but often it really doesn’t live up to all those expectations that we often have. The media portray images of idealistic families around the Christmas tree having all their dreams come true. For some people the reality is somewhat different, Christmas can be a traumatic time and managing with all the family can be challenging, but it can also be a time when some people are alone too. Here are some tips to help you navigate your way through the period and avoid your gut spoiling the fun. 1. Tis the season to be jolly – really? You have my permission to be a Grinch too if you wish. You should not be expected to see people and be jolly, especially people who you never get along with during the rest of the year. If you don’t get on with someone then Christmas is not a time that somehow the ‘magic’ will make a difference, and likely if your inhibitions are lowered with the odd glass of Advocaat (add your choice of tipple here!) it will not end well! Suggest that you have other plans this year, make your apologies for not seeing them if you wish. 2. Scenes on TV cookery shows promote the domestic goddess, but don’t forget all those well choreographed scenes take time and lots of other people to help, likely months of planning too. Not so much of a goddess then! So don’t try to live up to this myth of being able to manage it all, you will only end up frazzled and this will likely make symptoms worse. You could have a Jacobs join – were everyone brings a different part of the dish. Or you could ask people to bring dishes from around the world, and think of others or you could go out to eat on Christmas day. Consider inviting someone who might be on their own on Christmas day. It really doesn’t have to be a traditional day – make new traditions! Click on the image to see what Nigella really thinks. 3. Ensure you eat regularly on Christmas day – leaving hours between meals will not help, plan to have a light breakfast before your Christmas lunch – this doesn’t mean grazing all day either. Manage your portion sizes – use a smaller plate if you like your plate full and you will be just as satisfied and not over full and unable to move! 4. Don’t slouch on the sofa eating snacks whilst watching those Christmas movies, let gravity help you gut and try to sit up when eating – or don’t snack, you will eat more than you realise if you are not being mindful about what you are eating. Alternatively plan how much you are going to eat and put it in a bowl so you know when you have had enough. Your body will thank you for it. Seriously – not a good idea!! 5. Include some light activity mid afternoon if you are able – a gentle walk in the park perhaps or some games to get you moving around. 6. Family dynamics can be a rich source of conflict during the season, this can lead to arguments in the period leading up to Christmas and especially on the day itself. 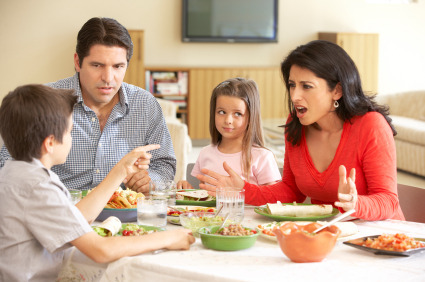 Arguments at mealtimes are really not advisable, this will do nothing to help your digestion. Stress causes your body to produce adrenaline, the fight or flight hormone, this is a response to conflict or dangerous situations, originally utilised so you can escape from predators. Your body is therefore NOT concentrating on digesting lunch. In the distant past a dose of indigestion was a very small price to pay to avoiding being eaten. So you might need to be assertive and lay down some ground rules for everyone to follow so that the meal can be as calm as possible. 7. Budget as much as you can. Planning is the key here and Christmas is for thinking of others, but not at the expense of experiencing anxiety at not being able to live up to their expectations. Again tell people in advance what you are planning, say that you are only going to be able to afford to do certain things – you may find that people are relieved that they don’t have to meet these expectations either. 8. Stick rigidly to your Low Fodmap foods (or other tolerated foods) before the day, so if you eat something that you react to, you possibly won’t have as severe symptoms as you would have with eating as you please for the full season. 10. The best tip is – remember to enjoy yourself – it is not money that makes the difference but being in the presence of friends, family and company on the day – spending time with others. It’s that time of year again – although it’s unusually warm outside this year! I purchased some gluten free frozen puff pastry and it is also Low Fodmap so here are some canapes to have with Christmas carols and shots – so invite your friends round and celebrate! They are simple to make, although a little fiddly to say the least. See below for the recipes. I could have made my own pastry – but life’s too short to be making puff pasty this time of year! A handful of chopped walnuts, 2-4 freshly chopped basil leaves, a handful of pine nuts and 10g of grated Parmesan cheese. Mix these ingredients together with a teaspoon of olive oil and spoon a small amount on the top of each disc. Top each with half an olive cut lengthwise. Place a small square of Serrano ham on each disk, top with a thin slice of cheese. Thinly slice small new potatoes and spray with oil- roast for 10 minutes in an oven and top each disc with the cooked potato and a small amount of shredded mackerel. Using the other half of the pastry roll it into an oblong block as this as you can brush with egg wash. Sprinkle with grated Parmesan and chopped fresh rosemary leaving a thin strip away from you without cheese. Roll adding further egg wash as you roll it up and stick down once rolled. Slice into 1cm circles. Place each disk on a baking tray and cook in a hot oven for 10-15 minutes until cooked. Serve with your drink of choice. Remember alcohol can, for some people make symptoms of IBS worse, so do take care. Your friends and guests will hardly be aware that these are gluten free. These canapes are also high in fat but one or two are all that are needed, moderation is always key – even at this time of year! They make a delightful change to the usual peanuts or crisps served with party drinks. I do hope you all have a wonderful holiday.